Men in Black 3 (2012) is a comedy movie and the sequel to Men in Black II (2002) and Men in Black (1997). Will Smith and Tommy Lee Jones reprise their roles as Agent J and Agent K respectively. Synopsis: An alien criminal called Boris the Animal (Jemaine Clement) escapes from prison on the Moon and kills the young Agent K (Josh Brolin) in 1969. The timeline is altered, the veteran Agent K (Tommy Lee Jones) is not around anymore, and the Earth is in danger from the attack by Boris' race, the Boglodites. Veteran Agent J (Will Smith) travels back in time to 1969 and meets the young Agent K in order to save him and the Earth. The best part of this movie is how surprisingly well Josh Brolin "impersonates" Tommy Lee Jones as the younger Agent K. He does it effortlessly, including intonation and facial expression. I did a little search and found out that he acted as Bretton James, the protagonist in Wall Street: Money Never Sleeps. 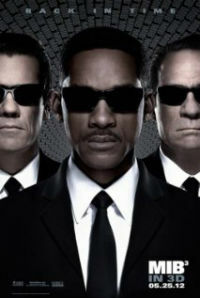 Men in Black 3 ends with a little back story that will touch your heart unexpectedly. I'm glad because it somehow gives a little weight to the movie. For those who have watched the first two movies, you will also be available to identity bits and pieces in this sequel. Overall, this is a nice entertaining movie that you would not want to miss! Cool! I don't have Astro so I usually have to watch movies in the cinema. Seldom buy DVD unless I ter-miss the movie. Haha.